I made these cards for a trader who liked my Buster Keaton card. She asked if we could trade Lillian Gish cards. 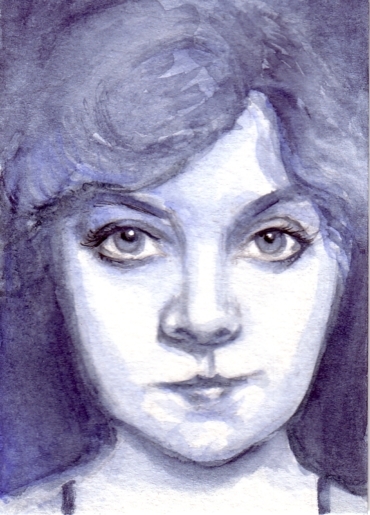 I’ve seen lots of her silent movies and find her face fascinating so I agreed immediately. I decided to use the trade as an opportunity to practice a little brush work and move away from markers. These cards were done with Ultramarine and Indigo watercolors. 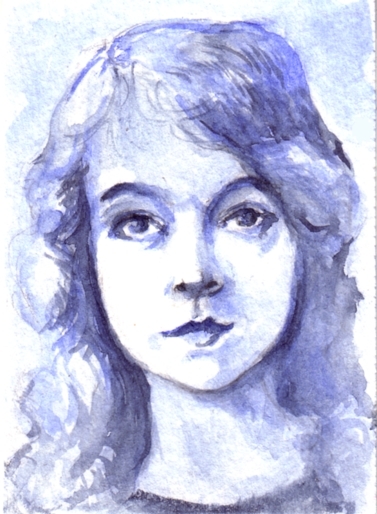 Lillian Gish (1893-1993) made 119 movies from 1913 through 1987. Most of her films were silent. One of her more famous (or rather infamous) films was D.W. Griffiths The Birth of a Nation (1915). I used to love watching all those old movies with the likes of Lilian Gish and her contemporaries. You have recreated her well. I particularly like the mysterious quality of the second image’s eyes. I envy your noses – I am useless at drawing noses. Oh Cathy, thanks! That’s funny that you mentioned the noses. My husband said the noses are what stands out for him. This is Gorgeous!! I love doing water colours myself and just came accross your blog while trying to figure out how to post them online. Nice effects you got all out here.. lovely!! Nice to see it all so organised. Kudos!! Thanks Autumn. I’m still getting used to watercolors. I haven’t been using them long and am self-taught. Perhaps you can leave me a link to where your paintings are posted. I wold love to see them.